The Coronet Apartments! Ocean front! On the boardwalk! Huge 4 bedroom condos! Our apartments are all Ocean Front. Just open your door to get to the beach and the Boardwalk! Our guests love the deck, private beach, huge yard and outrageously large interior. The fact that it is on the first floor is a plus as well! We have many happy handicap customers who say it is very accessible with wheel chairs. This large first floor apartment is Ocean Front. It is located in the peaceful residential section of the boardwalk. It is a great location for anyone who loves to watch the sunrise or enjoys people watching from the porch. The boardwalk, beach and ocean is literally one step off your deck. This four bedroom apartment is much larger than the average size for Ocean City and has a very spacious living room. This place comes with air condition, washer, dryer, dish washer, cable TV that includes music channels, two private parking spaces on our lot. The kitchen has a a full sized fridge, oven, stove, microwave, toaster, coffee pot, dishes, pans and flatware. This unit even comes with its own private beach. Have a beer on YOUR beach while the kids build sand castles. You won't find this feature anyplace else. This apartment has won numerous decorating and gardening awards from local magazines and newspapers. If you like to be out doors this apartment is for you. We offer over 1,000 square feet of exterior space alone. (Conmbined with the 3,000 square foot interior, you'll have 4,000 square feet) All of these outdoor areas are for your group or family alone. Nobody else in the building can use them. You get a sunny boardwalk Ocean front deck with 4 teak wood rockers and redwood benches built in, a sunny boardwalk Ocean Front private beach. Since it is private property you can drink alcohol in your beach and deck areas if you like and if you are over 21. You also get a shady picnic area with a picnic table, 3 benches, a few small and medium size tables for drinks and food, a redwood out door sofa, 4 redwood chairs and a stack of plastic chairs also. You get a large custom built charcoal grill built by an Italian mason and a 4foot by 20 foot big clothes line area for wet towels and bathing suits. Around the corner is a massive hydrangea garden which is usually surrounded by butterflies and humming birds. You may even see a neighborhood kitty cat sunbathing nearby. Your yard area is very huge and we try to keep beautiful greenery, colorful flowers, tropical plants, hibiscus and palm trees growing Spring summer and fall. We even have flowers and plants in the shady areas. We spend a lot of money getting the best quality and most comfortable exterior furniture that exists. We plan the landscaping so that whenever you come there will be something pretty blooming and filling the air with lovely exotic fragrances. We want you to feel the same experience at our beach in Ocean City that you would in a tropical paradise and we work hard to achieve this for you. Many places in Ocean City only give you a 100 square foot balcony with a few plastic chairs. The railings on the balconies of all the newer condos are so high that you would have to stand up to see the Ocean resting your chin on the rail but NOT HERE! We are a completely unique experience that can't be duplicated at any other location. We fill the interior with Ocean air refresheners. It is our goal that all of our guest experience their vacation with all 5 senses. The apartment was PERFECT for us!It had plenty of room for our big family of 14 people. The boardwalk deck was a huge hit. The views from the deck were amazing. The kids loved the private beach and the big Ocean front yard. 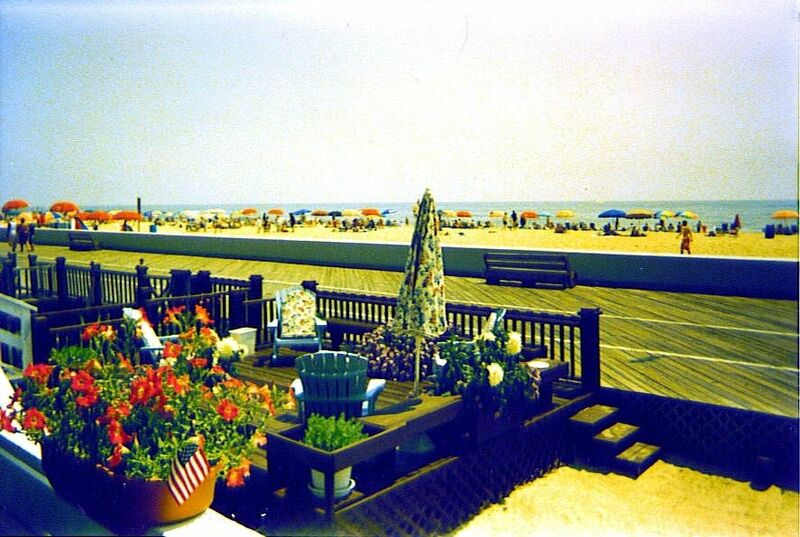 The location is RIGHT ON the boardwalk--we loved being able to just walk out our front door and be on the boards. It's not a block or two away. It is right there! When it is hot and you have to run from the beach to go to the bathroom or grab a soda, it is great to be that close. I highly recommend this rental for a family vacation to OC. This is the boardwalk. For anybody who ever played monopoly, you know it's one of the best locations in town. The residential part is very peaceful. Watch people stroll by and watch the ocean roll in. It's a 1 mile walk to the rides and amusements. Eateries, arcades and shops are all within a five min. walk. You don't have to deal with traffic, parking or that horrible park and ride. You are already where everyone struggles to be. The ocean breeze blows all the mosquitoes to west ocean City and assateague so you will be bug and pest free. It's also much cooler on the ocean than it is further back in town or over the bridge. 2 free public pools are within walking distance. If you lay on the beach you wont have to carry your chairs far at all and you can get home quick if you need to go to the bathroom or want to grab a soda from your fridge. May & October is $315- $500 per night plus tax. Discounts for all October car shows, VW, corvette week and hot rod endless summer cruisin. All the parades go by this house.